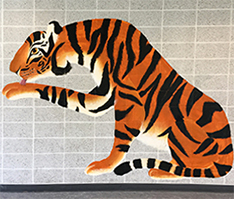 Athletics is an integral part of the total educational experience at Ridgefield High School. It is our goal to build a strong, unified athletics program where athletes, coaches, parents, and community members work together as partners to provide our students with a positive and rewarding experience. We have a great team of passionate and dedicated coaches who understand our athletics program is about more than just competition and winning. We encourage our athletes to strive for excellence and perform at their highest level both academically and athletically. Our athletics program encourages student-athletes to realize their potential and develop strong moral character, self-confidence, and valuable leadership skills. Parents will complete all sports registrations online through the PowerSchool Parent Portal. Access the "High School Page Links" tab on the lower left side of the screen. Note: The district does offer fee waivers in certain circumstances - an athletics waiver form is available. Physicals are valid for 13 months and each athlete must have a valid physical on file in the health office. Please submit hard copies of updated physicals to either the athletics office or the health office. Q: How do I verify that I have completed all the necessary steps? Q: How do I know if my child's physical is valid? A: On the "Athletic Information" page (see the answer above), the Date of Last Physical that we have on file is listed. Physicals are "valid" for 13 months from that date. Q: I cannot get into the RevTrak Web Store... what can I do? A: First, note that your username/password for the RevTrak Web Store may be different from your PowerSchool Parent Portal login information. For other assistance, refer to the instructions in the summer packet. Q: How do I know my payment has been processed? A: Once you make a payment through the RevTrak Store, you will receive a confirmation email. This may take until August 1 to arrive. Q: What if my child does not make the team/chooses not to participate? How do I get a refund? A: Students who do not make a team or choose not to participate can receive a refund of the PTP fee. In this case, please contact the athletic department. Q: I registered my child for one sport but wants to switch to a different sport... how do I do this? A: This is a change that only the athletic department staff can make. Please contact the athletic department. We encourage you to direct any questions or concerns to the athletics department staff, either Dane Street, Kathy Kelley. Kristine Lescinskas, and Anthony Cataldo. Looking forward to a fantastic winter season! Go Tigers! Spring sports registration will open in the Power School Parent Portal on February 1, 2019. Hello RHS families. As you may be aware, we now have two winter teams competing on Thursday, February 28 for FCIAC Championships. Boys swimming will be at Greenwich at 6:30 p.m. and our boys basketball will play against Danbury at 7:00 p.m. at Wilton. In an effort to adequately staff those events with athletics personnel and eliminate conflicts for kids, families, and fans who wish to attend, our spring sports kick-off meeting originally scheduled for Thursday, February 28 will now be on Wednesday, March 6 beginning at 6:30 p.m. I apologize for any inconvenience this postponement may cause and hope that you are still able to join us on Wednesday, March 6. We encourage all student athletes and their parents to attend this meeting to meet Dane Street, RHS director of athletics and learn his mindset about high school athletics. He will also cover some of the nuts and bolts of the day-to-day operations of the department and explain some of the processes that pertain to all of our sports. Following the full group session there will be breakout sessions throughout the building for each of the individual programs for coaches to share information about their program including the tryout schedule and process, as well as answer questions from students and parents. Baseball Pitchers/Catcher Conditioning - Athletes who should attend will be notified in advance by the coach. Note: The following links are to booster-affiliated websites. The Ridgefield Public School district is not responsible for the content of any referenced or linked off-site page. By providing links to other websites, Ridgefield Public Schools does not guarantee, approve, or endorse the information or products available at these sites. The district takes reasonable care in linking websites but has no direct control over the content of the linked sites.